This site provides a detailed “how-to” guide for submission of AIRR-seq data to NCBI repositories (BioProject, BioSample, SRA and GenBank). For other implementations of the MiAIRR standard see here. Submit study information to NCBI BioProject using the NCBI web interface. Submit sample-level information to the NCBI BioSample repository using the AIRR-BioSample templates. 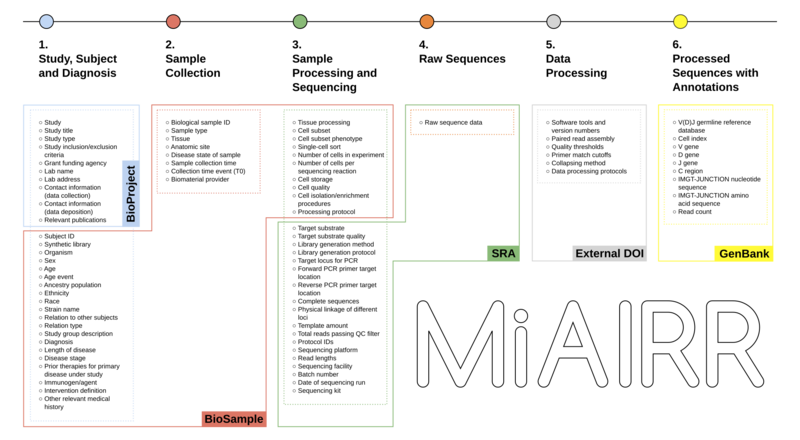 Submit raw sequencing data to NCBI SRA using the AIRR-SRA data templates. Generate a DOI for the protocol describing how raw sequencing data were processed using Zenodo. Submit processed sequencing data with sequence-level annotations to GenBank using AIRR feature tags. For step-by-step instructions on carrying out theses steps an AIRR study submission, see here.